This is the first Halloween costume I ever made. It was our first year in Salt Lake City, so my Aunt Rita wasn't near by to save me. Mom was gone. I had to come up with the goods on my own. My first mistake was to ask Johnny what he wanted to be (I later learned it was best to rummage through my fabric stash and make suggestions based on what I already had). My second mistake was something to do with cheap fabric. 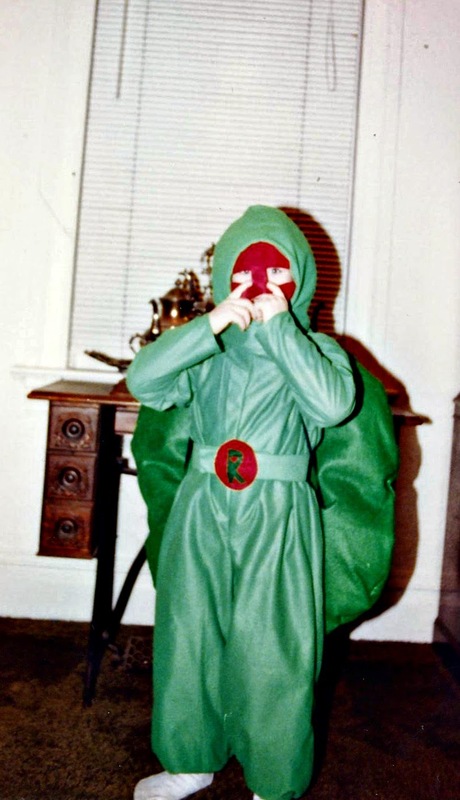 I don't recall what was wrong with it, but it didn't work out and I literally made two Ninja turtle costumes, one that worked and one that didn't. Total cost about $60. in an already very stretched budget! My third mistake was to hang on to the thing instead of selling it on or giving it away so someone else could get some use of it. Still, he was very happy with the thing and I felt I'd started to acquire some of my Mom's skills.